Dziner Travel Concepts is a well-reckoned tour and travel agent that is known for offering comprehensive travel solutions to clients. With our rich industrial experience, we have become a preferred Airline Ticketing Agent, based in Pune (Maharashtra). All you need to do is tell us your details regarding arrival, departure, destination, etc. Our expert Airline Ticketing Agents are committed to offer you excellent ticketing services. 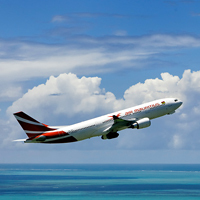 Contact our team of Airline Ticketing Agents to get the best deal on your air travel.